Meet Kate! Kate found us when her youngest was 9 months old and we have loved seeing her and her two boys at Saturday Stroller Strides ever since! Body Back has changed this mama's health and time; while she may be a multitasking genius, she has made time to care for herself a priority and everyone has noticed. She has a sweet and calming presence with a beautiful smile. We are so happy to have Kate as part of Our Village! Hometown: I was born in Oak Park and my family moved around the Midwest a couple times during childhood, but I consider Naperville my hometown – we moved back when I was in 5th grade. Tell us about who is in your family: I am the queen in a household of all boys: my super-supportive husband, Tim; Easton, 4 years old, and Sawyer, 18 months. Even our French bulldog, Bruno, is a boy! Current/Previous career: I work as the communications manager for a small non-profit membership association for emergency physicians. At my office, if the project “communicates” something, it’s generally my responsibility: writing, editing, website, social media, graphic design, marketing… The list goes on and on. It’s always busy and never boring. In the evenings, I work freelance on editing and graphic design projects -- party invitations are my favorite. What was your childhood ambition? I’ve always wanted to be a writer. As a kid, I wanted to write romance novels. In high school, I wanted to write for Cosmo magazine. In college, I wanted to be a newspaper reporter. I’d still love to publish a children’s book someday. What does motherhood mean to you? Motherhood is a study in contradictions and a crash course in finding balance. It means sacrificing everything for your little ones on a regular basis…but learning when to take time for yourself. It means wishing desperately for naptime…but missing those sweet sticky faces once they are asleep. It means being more tired than you’ve ever been in your life…but still feeling nothing but pure love when you stare at your newborn’s squishy cheeks. It means wanting to simultaneously laugh, cry, and scream at any given moment day-to-day with your kids. And it means learning to let go – of your own insecurities, your mistakes, your perceived failures. Before becoming a mom, I was a perfectionist. Now, if I leave the house wearing makeup and matching shoes, I consider it a win no matter what else happened that day. What is the furthest you have been away from home: In high school, I did a 3-week exchange program in Paris. Since then, I’ve been to Mexico and the Caribbean a few times but haven’t been back to Europe. I’d say it’s well past due. 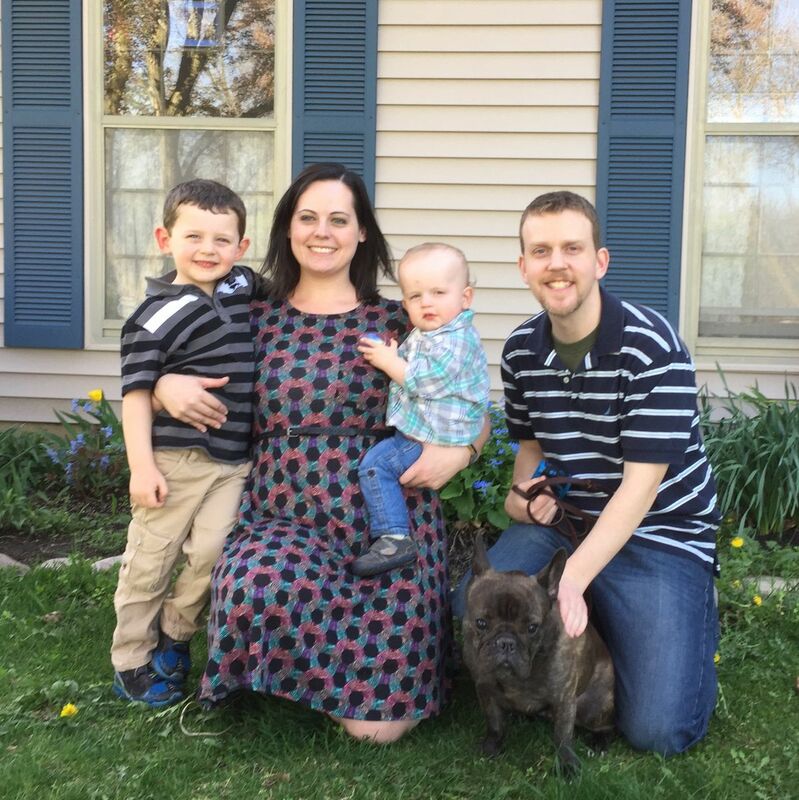 How did you find FIT4MOM: On maternity leave with our second babies, my best friend and I contemplated trying a class, but we determined that 9:30 AM was too early on a weekday morning to get out of the house (ha!) I finally found my groove balancing a full-time job and life with two kids when Sawyer was about 9 months old – right at the same time the Yorktown Stroller Strides classes were launching. I tried a class then, felt comfortable right away, and have been going to Saturday Stroller Strides ever since. How has FIT4MOM changed your life: In so many ways! I’m stronger, calmer, and more confident. Never in my life have I felt comfortable working out except at home – I was too self-conscious. But the unconditional support and welcoming environment at every FIT4MOM class I’ve attended has changed that. I look forward to my workouts and connecting with other moms at the same time. This summer, I took a leap and decided to try Body Back. I went into it expecting to lose a few pounds and tone up a bit. I came out with SO much more. Yes, the weight came off and I’m stronger and more toned. But it took Body Back to show me that focusing on myself for a change could actually benefit my whole family. I feel recharged and centered, more patient with my kids, less nagging at my husband. It was hard for me to let go of the guilt of skipping bedtime twice a week, but I'm so glad I did. My family can survive without me. And we are all healthier and happier because of it. Favorite exercise: I never thought I’d be a person who has a favorite exercise! Since doing Body Back, I’m hooked on tabata. I love the pace and variety. Proudest moment: I’m a big believer in the little moments as the most important. So, every time my two boys are giggling together or sharing a silly or sweet moment (and there are so many lately), my heart could burst. I’m so proud to be the mama of these two boys, and I know I’m doing something right when I see how much they love each other. Tell us something about yourself that would surprise us: I went back to work full-time after maternity leave with both kids, but I brought them with me to the office from 6 weeks old to 6 months old. Takes the “multitasking mama” experience to a new level!